How and when did you start getting interested in computers and programming? Well, I actually started when I was about 10 years old. I had my own website that I loaded up with about a dozen marquee tags and borrowed images from every website I could find. I was obsessed, but I was a kid, and thought that this was just a fun hobby and not something I could study like Math or English. Eventually, I just thought everyone knew these things and it wasn’t something unique. I went on to study Psychology and Statistics. I quickly realized that the world of academia was not for me, so I started looking for odd jobs after graduation. I made my way out to San Francisco a few months later, and practically everyone I met was a software engineer. I worked up the courage to ask what being a software engineer meant, and was pointed towards websites like Codecademy etc. At that point, my childhood obsession was reignited, so I started to spend all day everyday taking as many tutorials as I could. I would even retake tutorials if I ran out of ones to take. 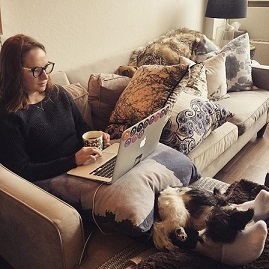 A friend caught wind of my coding frenzy and let me know about this coding bootcamp called Hackbright Academy that, at the time, was in his office. A few months later I started at Hackbright and haven’t looked back. How did you get into your current job? 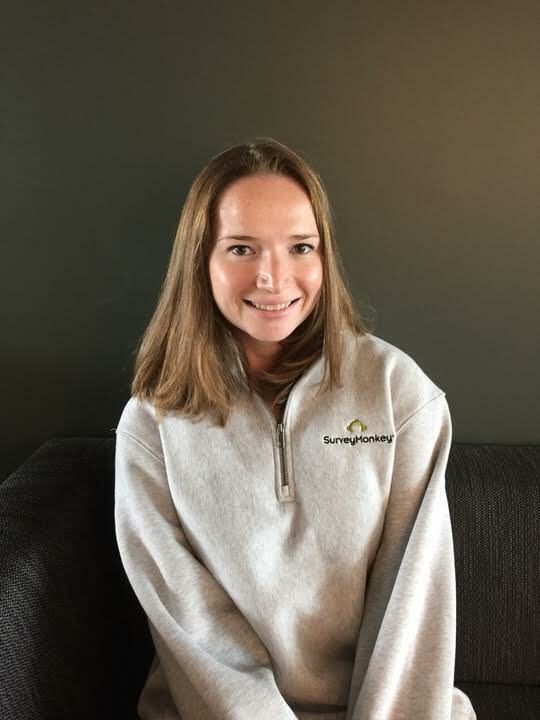 Sara rocking her SurveyMonkey fleece. 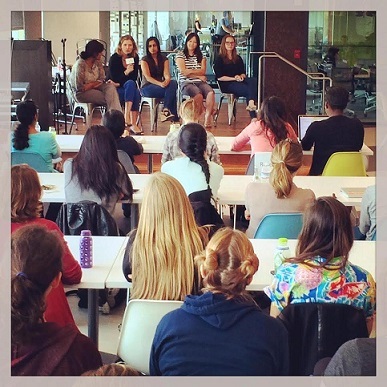 SurveyMonkey was one of the companies that partner with Hackbright for Career Day (video). I showed my project from Hackbright to the software engineer from SurveyMonkey and was later invited in for a full technical interview. There were a few things that I was looking for when I first started interviewing. One of the things was mentorship, and continuing to learn. I knew that I still had a whole lot to learn before I could really be an independent contributor, and wanted to work somewhere that not only knew that, but had the support system in place to help me continue learning. The second thing I was looking for was a culture that supported engineers from non-traditional backgrounds. I didn’t want to work somewhere where there was an assumed base knowledge – or a class that everyone else had taken – that I felt would make me feel like I was constantly behind, or would be impossible for me to catch up. The third thing I was looking for was, since I was torn between the back-end and front-end, I wanted somewhere that would allow me to function as a full-stack developer. What questions did you ask engineering teams when interviewing to make sure it was a good fit for your career growth? Do you have a mentorship program at your company for new engineers? If so, is it only for junior engineers or do all engineers have mentors? What are some programs that have helped engineers in leveling up? What’s the ratio of CS Degrees to non tech degrees on your team/ the engineering department? What does a typical team look like in engineering? What’s the spread of back-end, front-end, and full-stack? How easy is it to work on a project that isn’t necessarily in your area of expertise? These questions helped me understand if this would be a place that would help me reach my goal of being a full-stack developer. At that point I don’t think I was really focused on becoming a manager. I really just wanted to learn everything. Once I started, I got invested in the process and the people. 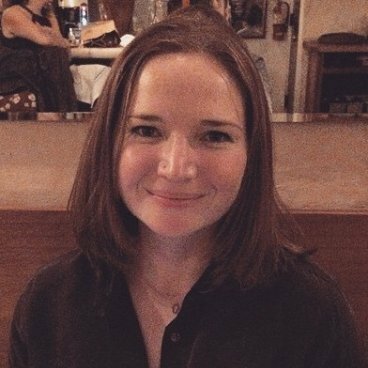 I had casually thought about my next steps, but it wasn’t until I read a profile on Jessica McKeller, an engineering manager at Dropbox that it really started to stick. She talked about traits that she identified in her team, and what path she would help put them on. I quickly recognized that I identified with all of the management qualities and started talking with my manager about it, and how to work towards that goal. I really just wanted to learn everything. Once I started, I got invested in the process and the people….I quickly recognized that I identified with all of the management qualities and started talking with my manager about it, and how to work towards that goal. Now that I am a manager, I think I’m trying to focus on learning more skills that will help me be a better manager while continuing to improve my technical skills. If you could go back in time, what advice would you have given to your younger self as you embarked on your tech career? I’m sure that almost every Hackbright alumnae has dealt with some version of impostor syndrome, and I was definitely not immune. If I could give my former self advice it would be to learn when to ask questions. I think I didn’t want people to know how little I knew, or how little I thought I knew, and I would just try to figure things out myself. Sometimes this was great because I would deep dive into docs and learn a lot. A lesson I wish I had learned earlier was coming up with an equation for cutting my losses and just asking someone to help me. I would fiddle with the same CSS bug for hours, and finally ask someone, and it would be a minute-long explanation. I think coming up with your “Just ask someone” equation is a good thing to figure out early. The other piece of advice I would give myself is that no bug is too small. I think I focused on getting assigned a feature really early, or would be more excited about features. I really learned our stack, and I had huge customer impact. I got to interact with more teams on what seemed like small bug fixes. What is a typical day like for you on the job as a software engineering manager? I usually start the day checking in on production by using Splunk and New Relic on the train while heading into work. After that, I will check in on how our upcoming release is shaping up and see if there’s anything I can do to help resolve some bugs or fixes. After that, I usually start working on my own tickets for that release – yes, I still code, reviewing pull requests, and writing/reviewing tech specs. We usually have standup mid morning. It’s an opportunity for me to share what I’ve been working on, but also to check in on what everyone is working on. After that, back to coding. I usually have a few meetings a day either having one-on-ones with engineers, triaging with our project manager and engineering director, interviewing, metrics meetings, engineering check-ins for larger projects, meetings about upcoming projects where I try to figure out who could work on this feature and how long it will take, and meetings about our intern program. We also have demos or tech talks every week. See – programming CAN be relaxing! Some things that I’ve done that I think have helped me get here: being a mentor, trying to teach, and leading a group. By assigning me a mentee and creating a mentorship group that lets people share advice and ask questions, Hackbright’s mentorship program has been a great resource in helping me learn how to be a good mentor. I have also tried to teach both in formal and informal settings. At work, volunteering to help explain something to someone, even if I don’t think I’m an expert in it. Formally, by helping with part-time classes at Hackbright Academy at one point. I’ve also started helping with our internship program at SurveyMonkey. I think these things have helped me learn some of the skills that I need, and also helped build the confidence to go for my current position. My favorite part of my job is that I get to help people. 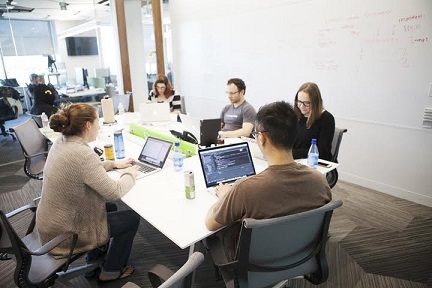 I get to help the experience team, engineers on my team, the product team, the design team, the customer and I get to help our users in leveraging their data to make better decisions. I’m constantly learning new things and being given opportunities to grow. Everyday feels like a puzzle that I get to solve by the end of the day. Sara is a graduate of Hackbright Academy’s Fall 2012 Software Engineering Fellowship. 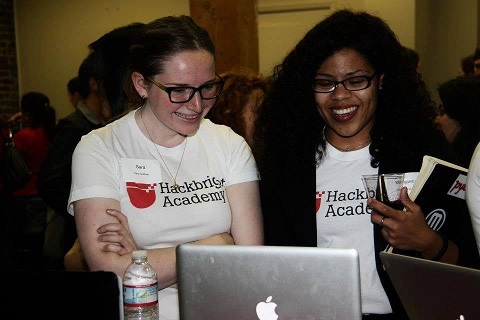 Hackbright Academy, the leading engineering school for women, is accepting applications. Join our next class and become a software engineer.